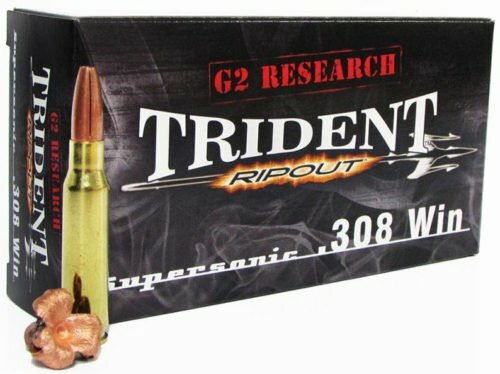 G2 Research has just announced the release of their new Trident .308 round. The Trident will incorporate several G2 Research innovations in bullet design, and will come in the lighter 150-grain bullet weight. Though particularly designed for big game hunting, the G2 Research Trident is a cartridge with serious law enforcement sniper applications as well. G2 Research is a relatively new ammunition manufacturer out of Georgia, but I can tell you they have made big waves in the industry after showing off the performance of their rounds at the annual SHOT Show. Basing their cartridges on an all copper bullet with aggressive side cuts, the expansion of several G2 Research bullets have been extremely impressive. The new G2 Research Trident could be a viable police sniper round. The G2 Research Trident aims to take the inherently accurate .308 caliber cartridge, charge it with a great all-weather load and quality brass, then it top off with a G2 Research precision CNC 150-grain solid copper rapid expansion Trident bullet. The Trident is designed to open up to an inch in diameter during the expansion process, before the petals curl back and maintain their mass to deliver the majority of the bullet’s energy on target. G2 Research is a company full of hunters and shooters, and they design their products to meet specific needs. The Trident is designed to provide fast, humane killing results at reasonable hunting ranges out to 500 yards. According to G2 Research, the Trident’s design provides superior expansion and controlled energy delivery without the meat-destroying hydrostatic (gelatinous) shock that can occur from an over-done magnum charge through and through bullet. The Trident has been tested and found to have an average penetration of 17 to 20+ inches. With that level of penetration the .308 Trident will easily get to the vitals of any big game in North America, and the killing power is enhanced by the incredible expansion it delivers with its three cutting copper petals. MSRP: $56.99 for a box of 20. There is an argument to be made by using a bullet that completes its energy transfer inside of the target, rather than punching through and dispelling some of its energy outside of the target. In hunting this can be beneficial, and help with dropping the animal right in its tracks. Some hunters prefer the through-and-through for an easier blood trail should tracking be necessary, but there is always a concern of bullet trajectory after leaving the animal. The Author firing a Steyr SSG 08 in .308 with 20″ heavy barrel. G2 Research has not specifically marketed the Trident for law enforcement uses, but I can see a potential for its selection. A police sniper with a .308 rifle needs a highly accurate round, but a round that expands and does not over-penetrate. The American Sniper Association (ASA), the premier law enforcement sniper’s association, issued a strong warning years ago to law enforcement snipers still using Match Boat-Tail, Hollow-Point (BTHP) rounds. The well documented over-penetration of the enormously popular and extremely accurate bullet, outweighed its benefits. As ASA pointed out, police agencies still using the BTHP rounds are bordering on reckless disregard should a through-and-through round strike an innocent person. ASA supports the use of Hornady TAP rounds due to their much greater expansion upon impact (though the heavier TAP bullets still have some over-penetration concerns). In law enforcement shootings, the path and performance of the bullet will often determine if the outcome is applauded or if the attorneys are going to sharpen their knives. Police snipers, often using .30 caliber rifles, are at much higher risk of this potential than patrol pistols or even some patrol rifle rounds. As such the decision on rounds must consider their ability to be accurate and expand significantly to avoid over-penetration. Then there is the whole other issue of intermediate barriers! G2 Research is an ammunition company to keep an eye on. We have been very impressed by their G2 Civic Duty ammunition. Whether the Trident will have the precision accuracy requirements for law enforcement is yet to be determined, but the enormous expansion and reduced over-penetration risk definitely should place them on the list to consider.